Although Scrivener for Windows is compatible with all versions of Windows from Windows XP to Windows 10, some systems may require enabling "compatibility mode" due to specific conditions on those machines. On these machines, you may find that Scrivener begins to launch but then shows "Not Responding." Changing the compatibility settings for the application is fairly easy, but may require a little trial and error. Screenshots in this article show Windows 10, but the process is the same for all versions of Windows. UPDATE: This article addresses Scrivener not responding when starting up. However, several users have recently reported that Scrivener may lock up (show "Not Responding") at random times after the program successfully launches, and that would be a different problem. In most cases this seems to be caused by a recent update to Avast anti-virus software. If you are running Avast and experiencing this problem, we recommend adding Scrivener's installation directory to the list of exclusions in Avast. We also recommend excluding any directories on your hard drive that contain Scrivener projects, as Avast may be scanning those projects while they are open, resulting in the lockup. We are continuing to investigate this issue. The first thing you will need to do is to use the system's file browser (called Windows Explorer) to navigate to the Scrivener installation directory. On 32-bit systems, the installation directory is "C:\Program Files\Scrivener". On 64-bit systems, the installation directory is "C:\Program Files (x86)\Scrivener". 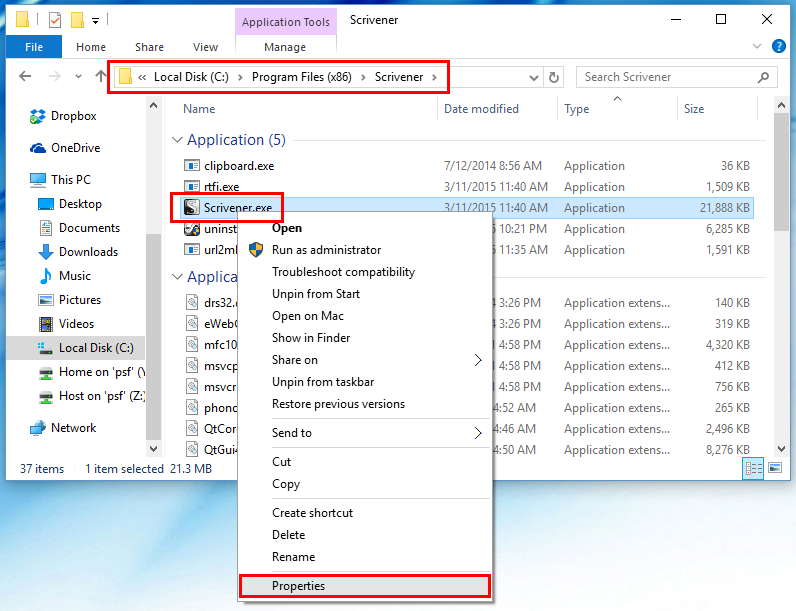 Once you locate the installation directory, open it and find the Scrivener.exe file. It may not be showing the ".exe" extension, as the default settings in some versions of Windows hide known file extensions. But you will recognize the Scrivener.exe file because it will have the Scrivener icon on it. Right-click on the file and select "Properties." Switch to the "Compatibility" tab of the properties dialog. 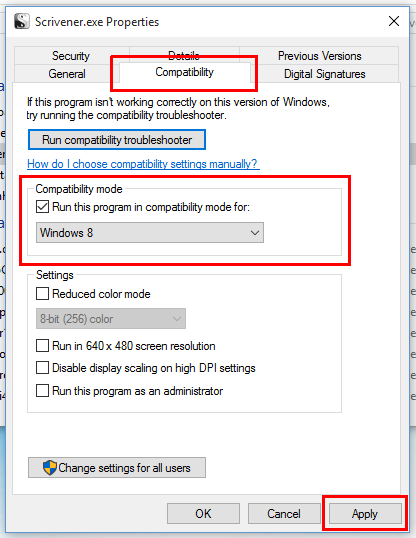 Enable "Run this program in compatibility mode for." If the drop-down box just below the checkbox contains an option for your current operating system (for example, if you are running Windows 7, and the box contains an option for Windows 7), use this option. Otherwise, use whatever the top option is. Click "Apply" and then try launching the application. If Scrivener still does not launch, repeat the steps above, but choose a different operating system under the "Compatibility Mode" options. Continue until you have tried all of the available options. You can also try enabling "Run this program as an administrator. If, after exhausting all of the options, Scrivener still shows "Not Responding" when you attempt to launch it, try re-installing the application from a fresh download. If the problem persists, contact us as windows.support@literatureandlatte.com.